The Chinese have a near lock on the perfect cold weather breakfast. It’s stick-to-your-ribs congee, or rice porridge, which is basically a small amount of rice cooked in a large amount of waer. 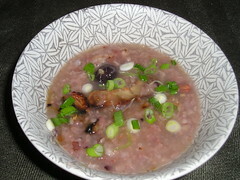 The version pictured here is 8-Treasure Congee, in addition to rice, it contains other grains, red (adzuki) beans, peanuts, lotus seeds, jujubes (like small dates), and delicate fungi. Ingredients can vary, ginger is a common addition, and some versions are even sweetened to make a dessert, maybe with the addition of some fresh fruit. I cooked mine all night on low in the crockpot, then stirred in some shredded leftover Asian barbecued pork and sprinkled some sliced scallion on top. We Armenians have a version of this called malez abour, with ground lamb and scrambled eggs added to cooked rice. Like oatmeal kicked up a few notches! I love congee! I used to eat it in Chinatown when I was a teenager. But unlike you, I don’t cook food all night, so I bought this product that was like Cream of Wheat, except it was cream of rice — like finely ground rice that cooks quickly. I may have bought it in Chinatown, but I think you can get it in health food stores as well — in fact I just bought a gluten-free cereal that is rice and corn grits. I will try to make your recipe. What kind of stock did you use? And where do you get the jujubes? I use water, this is the Chinese version of cucina povera, as the Italians say! The jujubes came with everything else, it was a bag of all those ingredients mixed. Actually, the label says it contains glutinous rice, black rice, green bean, red bean, peanut, Job’s tears, lotus seed, Chinese date (that’s the jujubes), lily, white fungus. Guess the rices are not counted as part of the eight treasures. There were no English cooking instructions, so I surfed the net for that. On top of the stove, it probably would have cooked in a couple of hours, tops, but I wanted to use my crockpot. Some people make up their own mixture, to account for personal taste, allergies, etc. I have seen jujubes in Chinese markets I think. They may even be available fresh at certain times of year, something makes me think I’ve seen them fresh, in addition to the more common dried. Have fun and let me know how it turns out! « What Would Obama Eat?